Zippy Junior is one of the most popular and best children’s entertainers in Wallasey. Every show is packed with fun, laughter, magic & music, and will always ensure a party to remember! 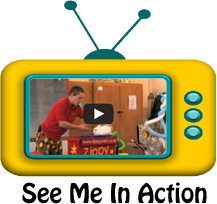 Zippy Junior is a magic children’s entertainer and has many years experience, even though he is just 26 years of age! Zippy Junior has an enhanced CRB, full PLI Insurance and all electrical equipment is PAT tested. All age groups can be catered for with Zippy’s shows, whether this be a child’s birthday party or close up magic at your wedding. Zippy Junior’s magic shows are tailored for children aged 2-8 years of age. Each show is tailored to the age group. For the younger children, Zippy Junior will incorporate beautiful visual tricks based around nursery rhymes. Zippy Junior regularly performs at many pre-schools and nurseries in Wallasey.